Cognitive behavioral education (CBE) should not be mistaken for Cognitive behavioral therapy (CBT) or vice versa. Unfortunately, their names are similar. Worse, their acronyms, CBE and CBT, sound almost identical. This confuses the public. Cognitive behavioral therapy is a highly evidence-based therapeutic approach widely used for alcoholism and drug addiction. This technique has also long been used for other problems such as depression, psychotic disorders, anxiety, criminal behaviors, bulimia, bipolar disorder, and many others. 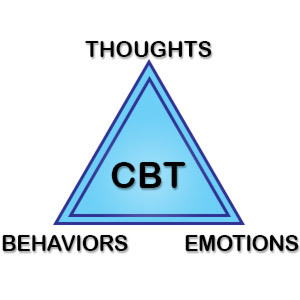 CBT is based on the fact that maladaptive cognitions (beliefs and ideas) are important in creating and maintaining emotional distress and problem behaviors. Changing the maladaptive cognitions leads to more positive emotions and desirable behaviors. CBT clients are active participants in a collaborative problem-solving process to change problem-creating cognitions and to change problem behaviors. Clients are taught the necessary information, skills, and techniques to help them achieve the objectives they set for themselves. The time frame is generally short term. It typically lasts four to six weeks and is offered on an out-client basis. However, because of its effectiveness, it is also typically offered as part of residential rehabs. Extensive research has proven the effectiveness of CBT and it is well-known. Many clients will only attend an alcohol or drug rehabilitation facility that offers it. Developed by renowned psychologists. Developed by laypersons without psychological training. Based on established psychological principles. Based on philosophy. Hundreds of published research reports. No published research report to date. Scientifically proven effective. Not scientifically proven effective. Widely recognized by psychological and other professional associations. Not recognized by any psychological or other professional association. Described in psychology dictionaries, encyclopedias, handbooks,and other reference works. Not described in any psychology dictionary, encyclopedia, handbook, or other reference work. Owned by no one. Freely shared with other professionals for good of clients and society. Owned by one corporation, Baldwin Research Institute. Not shared with professionals. Claims of effectiveness made by qualified researchers without any conflicts of interest. Claims of effectiveness made by corporation offering the program for money. After many years, no scientific, professional, or governmental body recognizes cognitive behavioral education. Nor is there evidence that it is effective in helping those with alcohol or drug problems. This does not mean that CBE is not effective. It means that after a quarter century there is no scientific evidence that it is. There is no scientific evidence that cognitive behavioral education is effective. Even worse, there is no reason to believe that cognitive behavioral education might be effective. It is important not to confuse cognitive behavioral education and cognitive therapy. They are different in almost every important way. Whichever you choose, make sure that it is the one you receive. Cognitive Behavioral Education. (cognitivebehavioraleducation.com) Web page of either the St. Jude Retreats or the corporation, Baldwin Research Institute, that owns the rehabs. Cognitive Behavioral Education. (soberforever.net/cbe.cfm) Web page of the St. Jude Retreats. Cognitive Behavioral Education (CBE): The Substance Use Approach for the Future. (baldwinresearch.com/cognitive-behavioral-education.cfm) Web page of the corporation, Baldwin Research Institute, that wholly-owns the St. Jude Retreats. Cognitive Behavioral Education. (inrecovery.co/2013/03/1271/) Description of CBE by the director of the St. Jude Retreats, Mr. Mark Scheeren. 1. Miller, W. R., et al. What works? A summary of alcohol treatment outcome research. In: Hester, R.K. and Miller, W.R. (Eds. ), Handbook of Alcoholism Treatment Approaches. Effective Alternatives. Boston: Allyn & Bacon, 2003. Pp. 13-63.